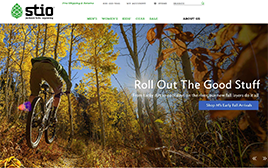 Description Stio was founded to inspire connection with the outdoors through beautiful, functional products infused with mountain soul. Stio is apparel you can live in- in both the epic and everyday moments of outdoor life. Stio finds inspiration from everyday immersion in life: on local rivers, trails and Teton Summits. Technical performance, quality and versatility are hallmarks you’ll find in every piece of apparel that Stio makes, be it intended for epic alpine pursuits or quieter moments of the mountain life.